Click to see this full size. Holly and I are in the middle, in pink, with our arms raised. 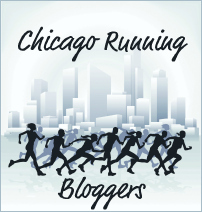 I apologize for the belated race report. Almost a week after the race I'm just now sitting down to write about it. Hey, a girl's gotta enjoy her vacation, too! For those of you that don't know the history, Holly and I have been online friends for at least 5 years. However, we'd never met each other in person. 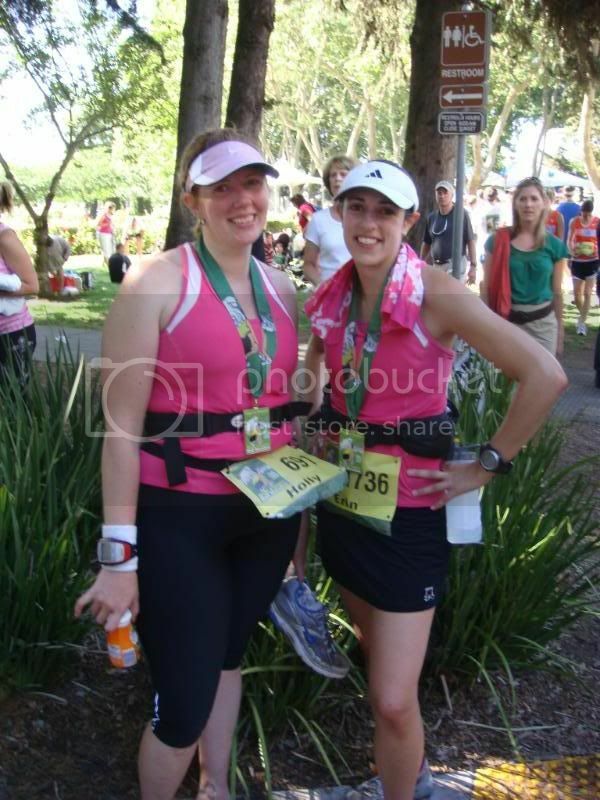 We started running about the same time and, although Holly had to deal with a knee injury and surgery, we decided last year that we were going to run a half-marathon together in 2009. 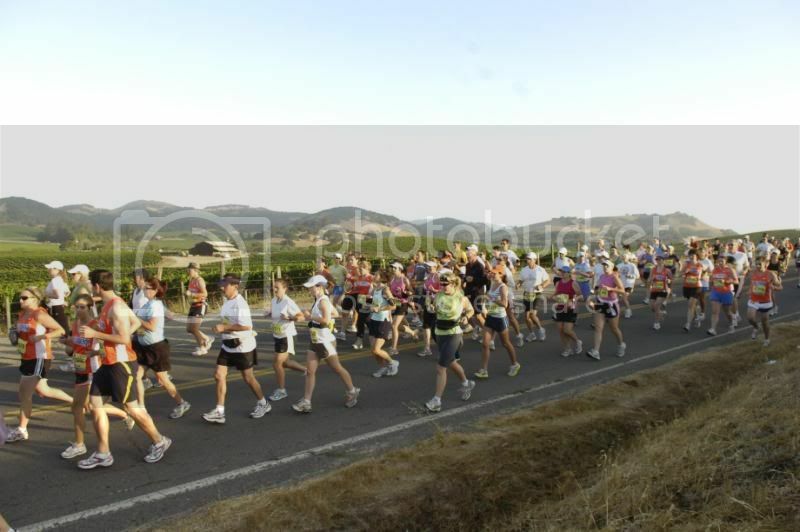 We chose the Napa to Sonoma Half Marathon because it's close to her and it's in a part of the country I love to visit. I was also able to convince my parents to take their annual wine country vacation with me at the same time. They rented a fabulous house for us all to stay in and were absolutely wonderful about coming out to cheer for us at the race. 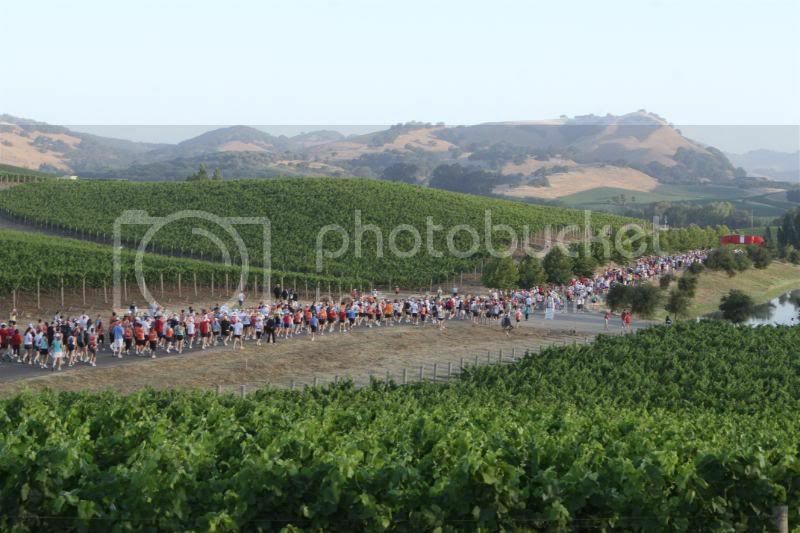 My mom even offered to cook us a pasta dinner before the race, but Holly and I already had plans to attend the pre-race dinner at the Nicholson Ranch Winery. Dinner consisted of several wonderful salads and pastas, bread, and two yummy desserts. Of course there was wine, too, but Holly and I decided to abstain. During dessert we listed to the Kimi Puntillo, the author of Great Races, Incredible Places. She shared a slideshow of photos of some of her favorite races while she talked about what it was like to run them. Running in Antarctica? How about on Mt. Everest? The Great Wall of China? She's done races on all three and many, many more. I'll probably check her book out of the library at some point. After dinner we headed back to the house to prep for our 4:30 AM wake-up! I laid out all my gear and I thought I'd be too excited to sleep, but I managed. Well, after I teared up a little bit thinking about how this day that we'd been planning for since freaking October 2008 was finally here. When my alarm sounded at 4:30 I jumped out of bed, dressed, and ate my standard English Muffin with peanut butter and cranberries. We drove to the shuttle bus lot and watched the sun rise on our ride to the start line. I think we must have been one of the first groups to arrive as there were hardly any people milling about. Other than that first huge incline, those hills were sneaky. I was not prepared for sneaky hills. In fact, although our plan had been to stick to 10:00 minute miles or faster, we only hit that on the second mile, which was mostly downhill. My body naturally tried to speed up but Holly kept reminding me to reign it in lest I be too exhausted to finish strong. We chatted as much as we could. We laughed at funny shirts. We enjoyed being cheered for by random strangers. We hammed it up for the race photographers. I'd never seen so many photographers along the course and I took advantage of it. But, at mile 10 I hit a wall. I started having trouble breathing just like I did the last time I ran 13 miles in training. Holly was awesome, though, and talked and walked me through the gasping-for-air episodes. I don't know what it is about mile 10, but we both hit a wall. I tried hard to fight it off but it slammed down on me anyway. 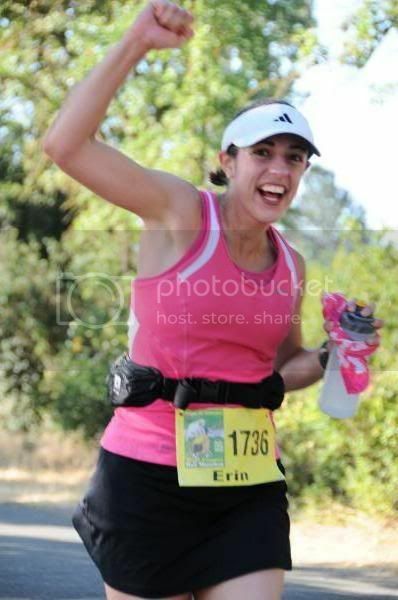 I think I must have a mental block about mile 10. The lack of shade and the sun beating down didn't help things, either. 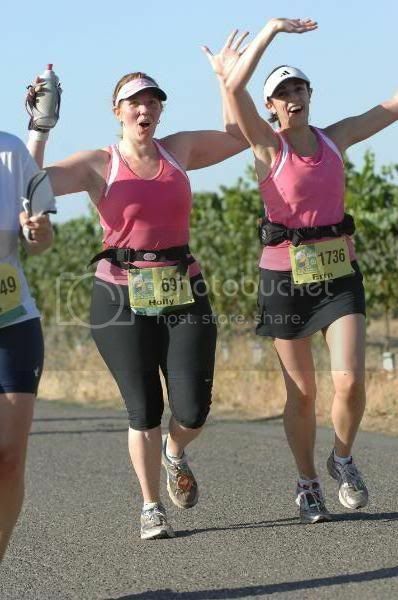 I have to say, though, that the other runners in this race were totally awesome. There was so much camaraderie. Holly and I kept leap-frogging these two women who were running for the big Crohns and Colitis charity team. "Go girls in pink!" they would yell. "Go girls in orange!" we would yell when we passed them. Click to see larger. See if you can find Holly and I in the middle of the pack. At one point we were trudging along and a guy ran up next to us. He took he headphones off his head and held them out. "Can you hear this??" he asked. We shook our heads no. "It's Pink Floyd! They're singing 'run run run run'!" We all smiled at one another and off he went. Sometime during mile 12 I realized we were running behind the school were we'd parked the car what seemed like eons ago. "Hey!" I shouted. "We're right by the car! Should we just head over there now?" The ladies running in front of us laughed and said, "I can't believe you just said that out loud!" 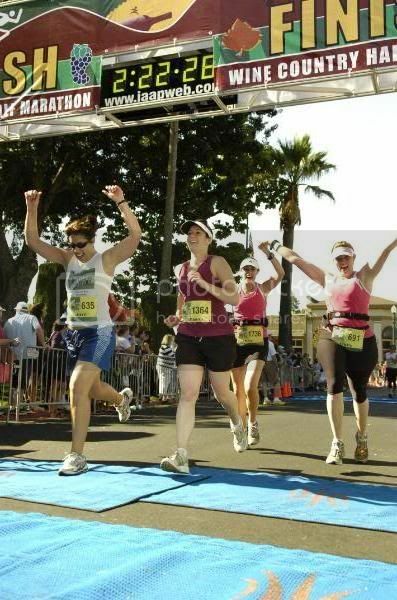 And when we crossed the finish line, holding our hands together and high above our heads, I screamed with happiness. The announcer yelled our names as we sprinted. Our goal was to finish strong and we did. Sure, there were quite a few walk breaks in there (during which Holly informed me I walk super fast) but at the end of this race I felt better than I did when I finished my first half-marathon. Granted, my time for this one was 7 minutes slower than my first one, but I was able to smile and, instead of standing around dazed, I was able to navigate my way through the food and water (post-race watermelon for the win!) 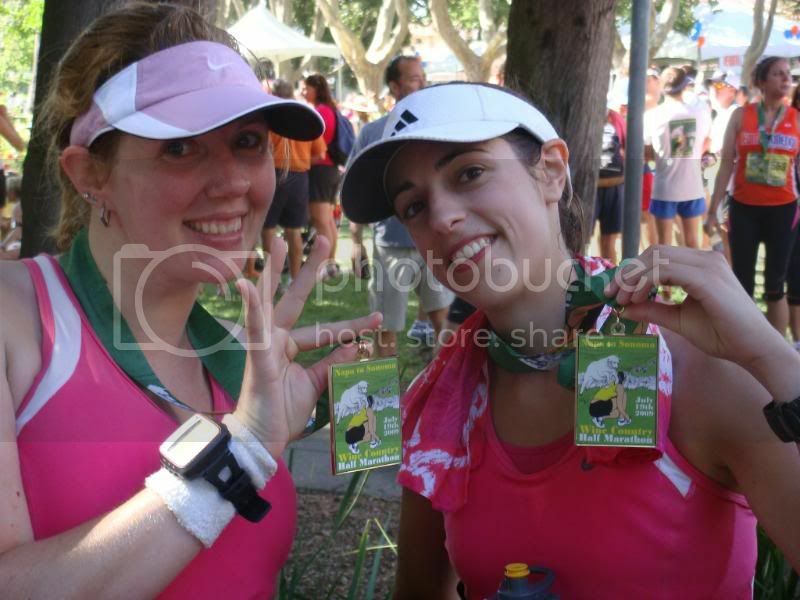 and even manage to pose for some great post-race photos. After collecting our commemorative wine glasses and checking out a few free goody booths (more post-race than at the pre-race expo, actually), we walked back to our car. On the way back to the rental house we talked about how good the pool would feel. We were so excited about the pool, in fact, that we barely manged to get off our shoes and Garmins before jumping in. Hey, running clothes are essentially the same material as swimsuits, right?? Pizza, chilling, and later, napping followed suit. 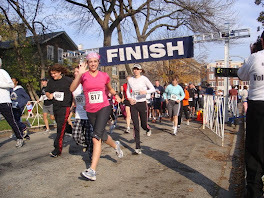 My goals for this race? Finish and have fun. I have to say I accomplished both. As much as I wanted the race to be over while I was out there, a part of me never wanted it to end. 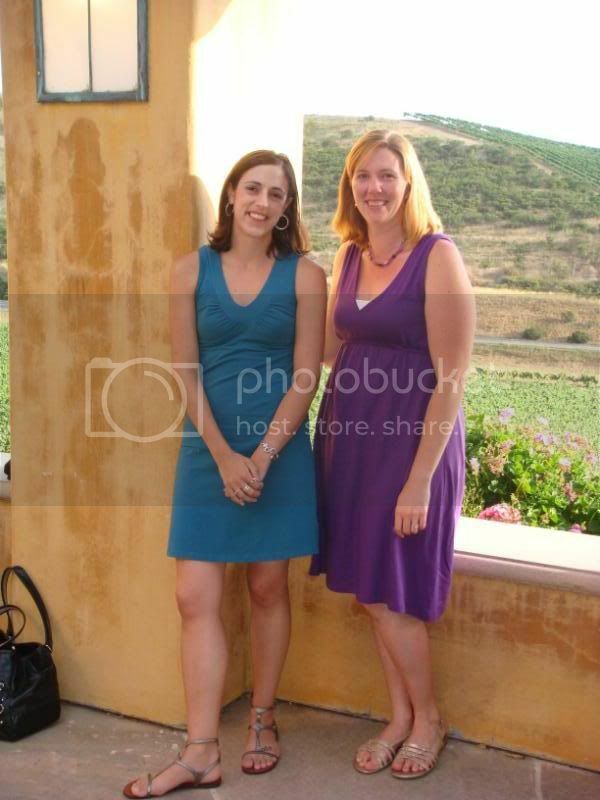 I already miss Holly and the California wine country. Who's up for another one? P.S. If you want to see ALL the photos, both race and vacation, check them all out here. Do you mind if i link in my weekend report? also i have a fuel belt giveaway going on if your interested. 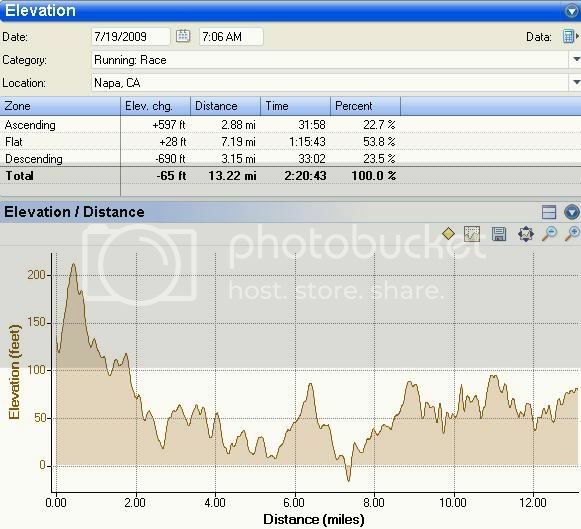 I like how YOUR elevation chart smoothed it all out for you. Doesn't look nearly as scary as mine! Hahahahah. I didn't want it to end, either. It sucked but was so awesome at the same time. We will definitely run a race together again. For reals. Cool race report. Sounds like you guys had a blast and took advantage of how fun a race can be. You even got some great race shots. I never get ones that good!! Great job Erin! Can't wait to hear about your next goal. Y'all looked great! I love the pics and the swimming video. Congrats on finishing another half. Great job! Love the pool jump! Congrats on your finish! I'll have to put this one on the list to run for sure.